I’m happy to welcome Janneken Smucker, author of Amish Quilts: Crafting an American Icon, who will be sharing her Amish quilt expertise with us here. 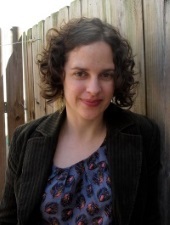 Janneken is Assistant Professor of History at West Chester University, consulting curator for the International Quilt Study Center & Museum at the University of Nebraska-Lincoln, and author of multiple publications on quilts and quilting (read a Q-and-A with Janneken on Amish quilts). Janneken recently visited a collection of Ohio Amish quilts on display in the Bay Area in California, and shares what she found in today’s post. 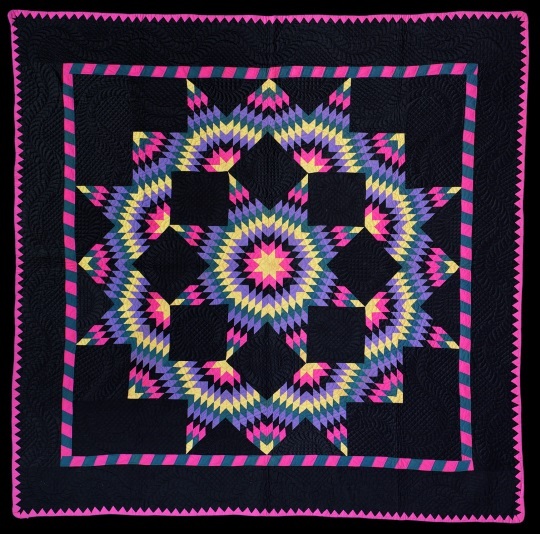 The San Jose Quilt And Textile Museum has a rare treat to behold: an exhibit of over 40 Ohio Amish quilts from the collection of Darwin D. Bearley, one of the few remaining outstanding Amish quilt collections in private hands. Distinct in part because if its regional focus, Bearley’s collection makes clear that Holmes and Wayne Counties were home to some powerhouse quilters in the late nineteenth and early twentieth centuries. Many of these Ohio quilts are particularly well documented with makers’ names and dates, since many Ohio quiltmakers stitched these details into their quilts. Bearley also had the benefit of buying quilts directly from Amish families by knocking on doors, targeting advertising directly to Amish families through the Sugarcreek Budget, and attending auctions at Amish farms; and significantly he had the foresight to record makers’ names, towns, and dates when he was collecting these objects in the 1970s and 1980s. The dates in particular give great insight into what we know about Amish quilts. We can see the earth tone shades of fabric dominate during the late 19th century, with a preference for black emerging in the early decades of the 20th. 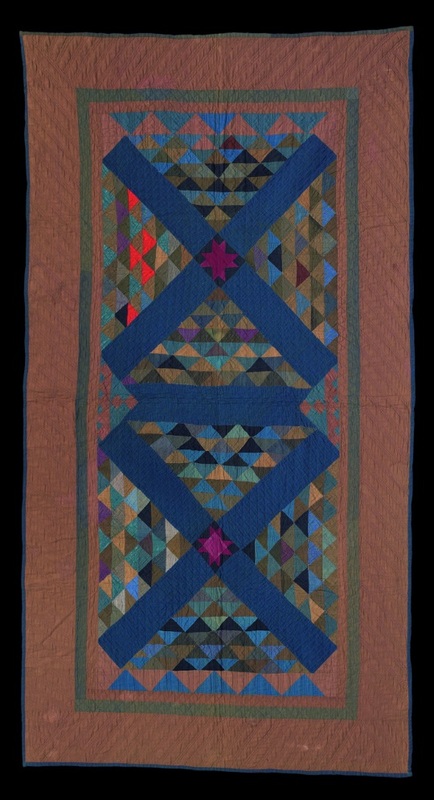 Even the earliest quilts in the exhibit are quite complex, with quilt makers tackling the intricate piecing required by Railroad Crossing, all variety of stars, and Log Cabin quilts. Railroad Crossing, c. 1875-85, Unknown maker, Mt. Hope, Holmes County, Cotton. Collection of Darwin D. Bearley. Like any collection, we need to read between the quilting lines and remember the group of quilts on display says as much about the visual preferences of Mr. Bearley as it does of the Amish makers. Collectors choose what suits their taste, and Bearley acknowledges that over the course of several decades he has honed and refined the collection, replacing quilts when better examples became available. And like most collections of Amish quilts, left out are the quilts that did not fit the collector’s eye: ones that might look more “mainstream” with lighter colors, appliqué, or printed fabrics. I had trouble choosing a favorite among the amazing quilts in this exhibit. I loved the broken dishes quilt pieced almost entirely of lush cotton sateen, aside from a few unexpected white triangles of a twill fabric, that dazzle like moths wings in the night sky. Broken Dishes, c. 1925, Unknown maker, Holmes County, Cotton. Collection of Darwin D. Bearley. 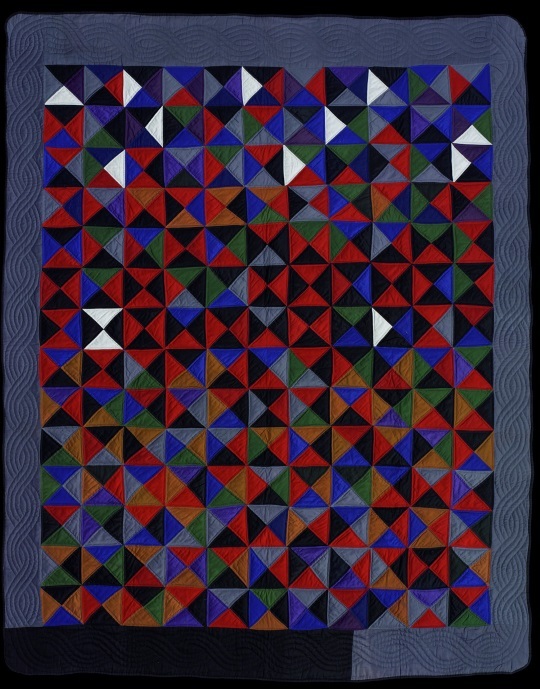 Another quilt pulls at my heartstrings because of one particular technique: the sawtooth binding on the outer edge. This intricate detail was a specialty in eastern Ohio: in fact my mother’s family had a couple great examples of quilts with this treatment. My grandmother once explained to me that a certain quiltmaker in their community was gifted at applying the sawtooth border and my great-grandmother traded her specialty—quilt marking (applying pencil lines in an ornate design to show where the quilting lines should go)—for binding. Broken Star, c. 1925-30, Made by Katie M. Yoder, mother of Mrs. Henry A. Raber, Baltic, Holmes County, Cotton. Collection of Darwin D. Bearley. The Californians here to see the exhibit seem to universally love it. Many of these quilts have never been exhibited before in the United States. If you’re lucky enough to be in the Bay area, stop by to see these historic quilts, along with a small gallery of modern quilts inspired by the Amish. The exhibit runs through March 1, 2015. The Amish culture is gifted with unique expressions of creativity, inventions, adaptations and creative works abound. But the quilts are one of the expressions of individuality and artistic ability that catch the public eye and are known worldwide. The “broken dishes” is almost alive. The various patterns evoke “seasons’ in my mind. Thank you for this presentation. I have close Amish friends who are currently in the quilt season. I can share what I have learned from them about real Amish quilts, as I am interested to marketing theirs. They are Old Order and very “Plain” so use only the colors of blue, brown, teal and green. No other colors esp. red would be acceptable. They have recently completed a Unique, Light in the Valley, Jacobs Ladder, Star Dahlia, Log Cabin Broken Star, Rose Wreath and Feathered Star. They will quilt any pattern, but can only use the above colors for their homes, and that kind are the ones I am most interested in. Tops are usually cut and sewn by treddle machine (some hand do the tops). They can be purchased already sewn or as kits to be sewn from Amish Quilt shops (real simple ones in Amish communities) usually for Amish, although English can buy. They are then placed on the frames and quilted. First they use a stencil to lay all the lines and then do very small hand stiches. My friends recently hosted all the teen girls to come over to quilt (a frolic) as their 2nd oldest daughter needs four as she will be getting married probably next fall. All girls are given four for their Hope chests along with a sewing machine, dishes, gas iron, ect. Next week the “older women” are coming to quilt. It is a very lovely site…..they all look one armed, as one arm is under and one arm on top! The young children all play quietly in the same room (no fighting here). I am in heaven when I am there. They all dress in “Sunday” dresses and are served a hearty lunch. I am particularly interested in these authentic quilts. Many of the ones in the Tourist communities (my friends are not) are even sewn as far away as Thailand. I even heard in Lancaster County Hmong quilters make them and they are sold as “Amish”, so you really have to ask questions. Very interesting! Are you a collector or do you run a shop? The various colors allowed is a precious part of the story here. I enjoy the feeling these simple colors give to a room. We have a Quilting Store here in Fredericksburg Texas that holds quiltings and classes, and the locals are fond of Amish patterns. No, I am not really a collector or a quilt shop owner. I have a store in NY who wants to see photos for possible sale, and a local Nationally recognized museum, who are interested in shows and sales. I just enjoy helping them out and it’s great fun! We’ll see if anything works out. I love the Amish and Mennonite quilts from PA. I spent a couple of trips there and found everyone so friendly. I have a wonderful Mennonite woman who quilts for me. She is awesome. I have two beautiful quilts hanging on my wall from her shop. Good Luck!! It’s interesting how working under a set of limitations often produces the most beautiful results. Shaker furniture immediately comes to mind, but perhaps a better example would folk music that has been produced in various isolated communities. Many of the most haunting melodies were composed by people with no formal training and hardly any contact with the outside world. How very true, the oldest living tree in North America is the Great Basin Bristle Cone Pine. One member of this species, at 5064 years old, is the oldest known living non-clonal organism on Earth. These trees grow on isolated Mountain tops, wind blown, exposed to the elements and within this set of “limitations” it has outlived many other forms of life. With its well worn trunk and branches, often just a crown or cloak of green testifies to the life within, and the occasional smattering of pine cones insures it will continue, it is truly a monument to simplicity. In the same way, the Amish quilters are giving life to an enduring testimony of the Amish culture. Never underestimate the importance of what God gives you to do today because it is building some one else’s tomorrow.